We’ve all seen a lot of chain link fencing, and to be honest, it’s not going to win any awards for beauty, aesthetic appeal, or completing “the look” of any location. That said, it’s used everywhere for many different projects and it there is a great reason why. It works. Very simply put, it’s one of the most practical, quick to install, and affordable forms of effective fencing out there. It’s a no-nonsense option. That said, when you come to us for chain link fence installation, we will use the most proven and reliable materials and you will be delighted with the strength and the build of your fence. And not only that, while chain link isn’t really intended to look stunning, with us there are options of styling your fence that can make it match your home or business design. For example, our vinyl coated chain link fence installation is available in and around Paterson, NJ, and features charming colors like black, green, white, and brown. These colors are an easy way to add a lot of charm to a functional fence. Pets are a wonderful thing to have, and there are many reasons for having one, two, three, or more! Whether you’ve got a cat, a dog, or a less common type of pet, you know what we mean when we say they truly become part of the family. And you’re surely familiar with their natural desire to explore the outside world as well. The thing about pets is that they grow up in an area, and if they get out, they can get so excited to explore that they don’t even consider the eventual need to get back home! Dogs, for example, just love to run away to explore, but when they’re a mile away in an unfamiliar area with different smells, it’s hard to find your way home. A chain link fence around your property is the perfect way to avoid this happening for your well loved pets. It’s cheap, practical, and extremely functional. Depending on where you live, you might have wild animals that sometimes wander into your yard. These animals come looking for food or warmth, and sometimes just to explore a new place. We sometimes refer to these feral animals as pests because they can create a real problem when they frequently intrude on your property. If you’ve got pets in your yard and another animal enters, it can start a fight in which one of them will be injured or get a disease. This is of course the last thing you want, and the easiest way to keep those pests out is with a good fence. Chain link is a great option. If you like to garden, a good fence will keep those types of animals like to feast on your hard work out of your yard too! There are other reasons to have a fence around your property as well. There’s a saying, “good fences make good neighbors,” and while this isn’t always true, you never know when a new neighbor might move in or when an old neighbor might start intruding on your property. A sturdy, pleasant looking fence is not only practical in every way, it’s also makes it very clear where everyone else’s land ends and where yours begins. It can also be a great protector in legal, safety, and security reasons. 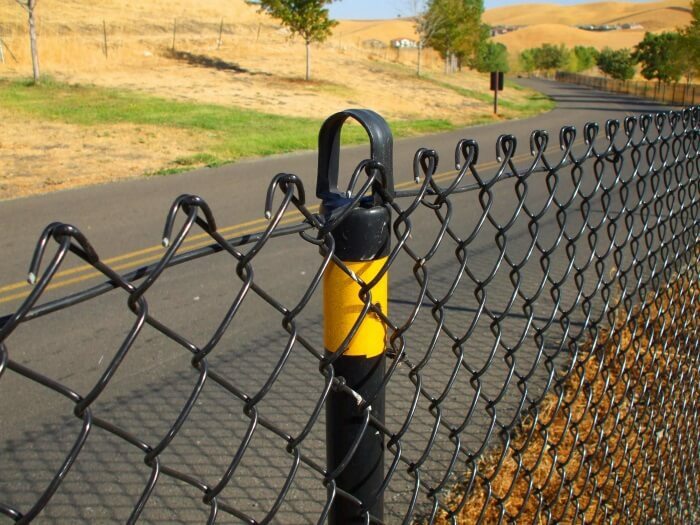 Chain link aren’t necessarily the prettiest fences, but you will be happy with their quality. We have someone by the phone during all work hours, so if you’re reading this page and thinking you need to get yourself one of these quality fences, then give us a call. Our number is readily available all over the site, and you should see it above right now! We will be happy to take your call, answer any questions you have, and make sure you get the service you’re looking for.